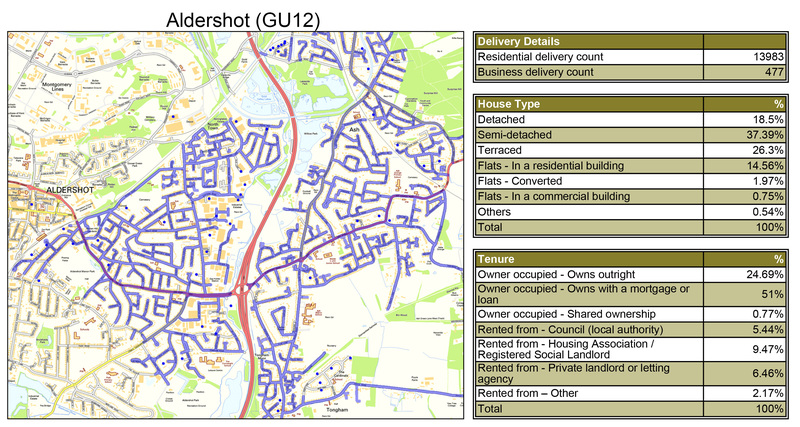 Abracadabra Leaflet Distribution offers affordable and reliable GPS tracked leaflet distribution Aldershot GU11 – GU12. We have invested in the latest GPS tracking technology and all of our leaflet deliveries are GPS tracked. Our clients usually come to us with a vague idea of what they want their leaflet campaign to achieve and, after a quick discussion, we can offer a bespoke geoplan mapping solution to tap into their target market in the most economical way. No matter what your budget may be, our dedicated team will find a delivery framework that works for you and gives you the best possible results. We can offer you as little or as much support as you like; whether you need us to help with all or just part of your direct marketing campaign needs, we’ll get the job done in the most professional and cost-effective way. For the best possible return on your investment, you can also make use of our in-house marketing and design team who offer customised design, print and distribution packages. To give you added peace of mind, we take immense pride in being a member of the Leaflet Distribution Organisation(LDO) and we follow their ethical code of conduct. But don’t just take our word for it – see what our clients have to say about us by visiting our testimonials page! As the saying goes ‘the best things in life are free’, so let’s start by telling you the host of FREE services and other benefits we can provide for your leaflet distribution campaign. If you combine your needs, we can offer you an incredible discount on design, print and distribution package. FREE report of household numbers for your targeted postcode so you will know how many leaflets to be printed. Aldershot is a town in the English county of Hampshire, located on heathland about 37 miles south-west of London. Aldershot is known as the “Home of the British Army”, a connection which led to its rapid growth from a small village to a Victorian town. For your direct marketing campaign, Abracadabra Leaflet Distribution Aldershot can cover the town as well as areas including the postcodes of GU11 & GU12. Promote your business with us to get amazingly low prices on your printing too; you can get an additional discount on your leaflet delivery when you order both your print and flyer distribution together from us! With our leaflet delivery service attracting a repeat business rate of approximately 80%, you can’t go wrong with our complete service.